The service medals of a Clare-born casualty of World War One, including a Purple Heart, have been donated to Clare Museum. Private Dennis Liddane from Rehy in Kilkee, who emigrated to the United States when he was 18 years of age, died in the Meuse-Argonne sector of the Western Front on October 10, 1918. He served in the same Division and fought alongside Sgt. Alvin York, the most decorated American soldier of World War One. Born in 1893, he was the youngest of ten children and emigrated to the United States, arriving in New York on August 30, 1913, joining his siblings who had emigrated before him. He lived in New Jersey, became an American citizen and obtained a position as a guard at NY Edison – an electricity company. He worked there until he was drafted into the US Army in 1917 following America’s entry into World War One. He was sent to France with the 327th Infantry Regiment on April 25, 1918 and subsequently died of wounds received in the intense fighting that occurred in the final weeks of the war. He is now buried in the Meuse-Argonne Cemetery, the largest American Cemetery in Europe, with 14,200 other War Dead. Throughout the decades that followed, a photograph of Dennis Liddane hung in a room in the family home in Kilkee. A grandniece there, Helen Kennedy, became interested in Dennis’s story and began researching his military career, recruiting the assistance of an American based first-cousin and grand-nephew of Dennis Liddane, Marty Halpin, when required. The research culminated in a visit by his three grandnieces, Helen Kennedy, Pauline Cummins and Dell Fitzgerald to his final resting place on October 14, 2009. They also visited the site where Dennis received his fatal wound. 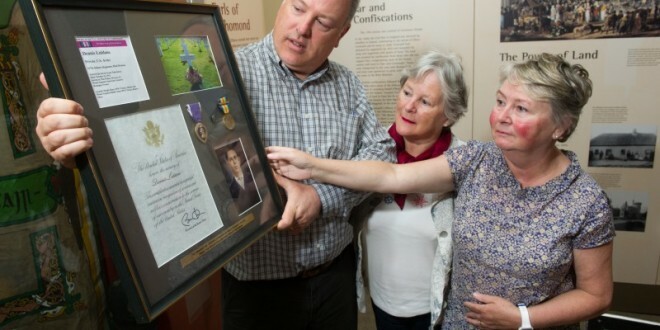 In the United States, Marty Halpin compiled a memorial to Private Dennis Liddane which includes the Purple Heart, a World War One Victory Medal with Meuse-Argonne Battle Clasp and a Silver World War One Victory Button. The presentation also includes photographs of Dennis Liddane and his final resting place and a citation signed by President Barack Obama. Receiving the presentation on behalf of the museum, curator John Rattigan said that “During World War One about 700 Claremen died in the service of the British, Commonwealth, French and American Armies. Dennis Liddane is one of a growing number now represented in the museum collection and this presentation will be a useful addition to future exhibitions on the Great War”.